Maybe you’ve read that carrots are a challenging crop to grow? Maybe you’ve tried in the past only to have grown a wee little thing that might somewhat resemble a carrot. I’m here to urge you to try again BUT in a container! Growing full sized, straight, delicious and picturesque carrots may come across as difficult but I will show you that it’s not. 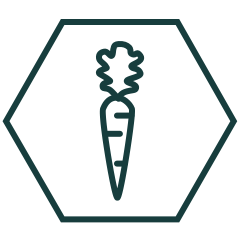 There is a carrot code for containers and as soon as you figure out that code (a.k.a. watch the video above and read these thoughtfully crafted words below) you’ll grow wonderful carrots every single time from here on out (Mostly! I mean…. I can’t be spying over your shoulder in the garden at every moment!). Thinned out, they must be! Patience is a virtue – carrots can be slow! What size container will work in your space? How many carrots do you want to grow? Whether it be a stoop, balcony, porch, rooftop, or small deck, carrots don’t need much space to grow so find a container that fits your space. The length and width of the container can be to your preference but it should be at least 20” inches deep. The length of full grown carrots vary from variety to variety so read the specifics on the seed package. For example, the Paris Market variety (which are wickedly adorable and fun to grow) are short and stubby so they would not need as deep a container as other varieties. There is a wide variety of different shapes and colors of carrots to choose from. Pick whatever shape, size or color excites you but make sure you have enough time in the season to grow them. Look on the seed package for “days to harvest.” That number tells you the average amount of days, from germination to harvest that it takes to grow to full size. Carrots can take anywhere from 55-150 days to grow. Select the variety you want to grow with this number in mind. 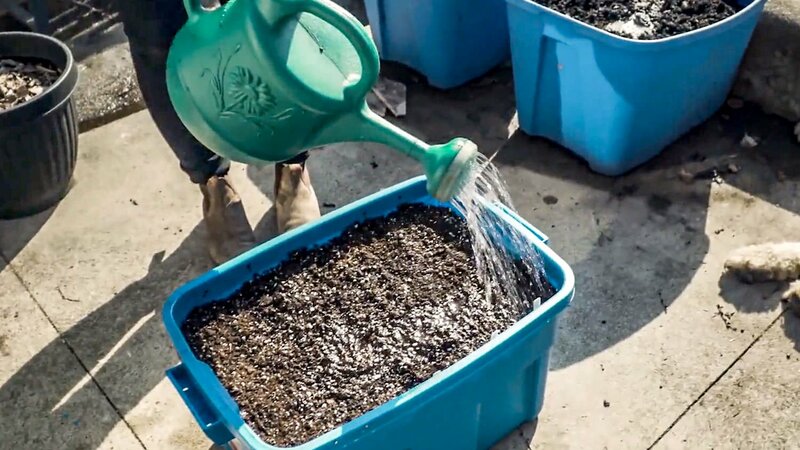 Fill up your container with good soil made for growing vegetables, worm casting and/or compost (or a triple mix works well). Lightly water the soil before you add the seed. This will help the seed stick to the soil because carrot seeds are teeny tiny. It’s best not to seed carrots on a really windy day. Use your hands, a trowel or whatever will work for you to fluff up that soil. Really loosen it up. Remember when I told you that carrots were lazy growers? This is when it’s time to be thorough. Loose soil, free of debri like rocks or wood chips will ensure a smooth growing journey for your carrots. Seed depth and spacing on packages can sometimes be misleading. But there’s a trick that will work every time. Flatten the soil as best as possible without compacting it and gently run your finger in the direction you’d like your carrot rows to go. As a general rule, carrot seeds should be planted about ¼” deep but if you’ve gently (really, truly be gentle) run your finger up to your nail lightly along the soil, that depth will suffice. Drop a couple of seeds every ½ inch or so. You are aiming for uniformity here. Thinning carrots is a tedious task but you’ll want to have sown enough carrots that you have a full and even row later. Although it will be easier to weed between rows, carrots don’t need to be grown in rows. If your chosen container is round, carrots can be planted in a circular formation as long they’re thinned with ample growing space. I’ve grown carrots in circular containers many times! Lightly cover the seeds. Sometimes I take a handful of soil from a trug and lightly sprinkle over top of the sown seeds, or I push back the soil from either side of the row. Lightly pat down so the seed has good contact with the soil. If you are planting different types of carrots in one container, which is encouraged (variety is the spice of life after all! ), label each row as soon as you sow or the laws of gardening will sneak in… you’ll forget. Gently water from above with a watering can or hose attachment that has a light shower/sprinkle option. This is really important! If you use a strong force of water with direct pressure, those vulnerable little seeds will shift all around and your precision seed sowing will be destroyed! Keep the soil moist throughout the entire time the seeds are germinating. I become obsessed with this part. There’s no way I am drying out those seeds after all of the detailed hard work it took to plant them! Do your beautiful seed sowing diligence. Cover them with a lid of some sort, a piece of light plywood or glass will work. Water won’t evaporate as fast with it covered. One common misconception is that seeds need light to germinate. They don’t! 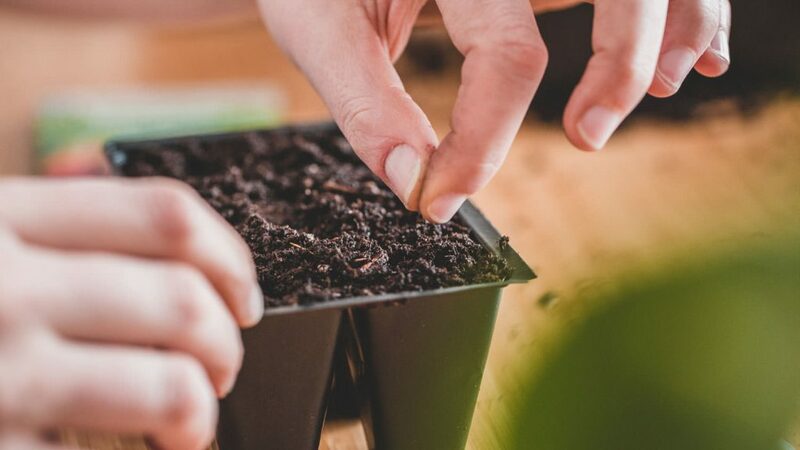 Cover ‘em up until you see little bits of green emerging from the soil’s surface (don’t worry about your lid or wood touching the soil, just check frequently for germination). Be patient, carrots can take a couple of weeks to germinate. Rule of thumb, soil in containers dry out quicker than in-ground or raised garden beds so keep your eye on the watering can and your future carrot bed. 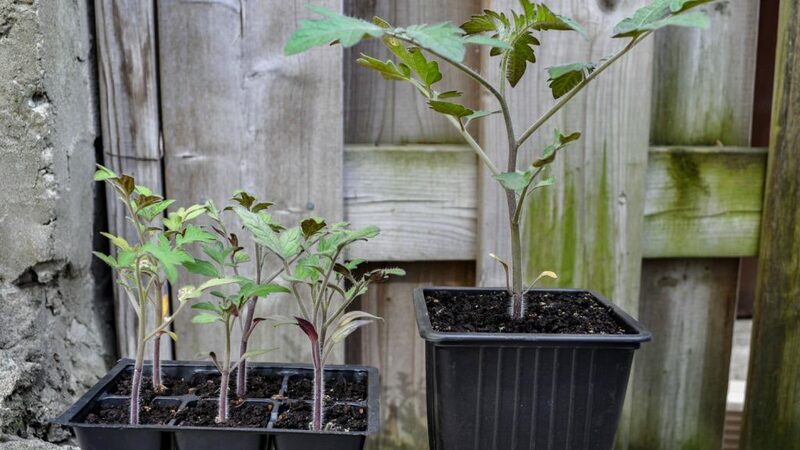 Anytime they’ve grown around 2” inches high, cut or gently pull out seedlings to give about 2 ½” inches on either side. Thinning any kind of seedling is notoriously hard and you might be thinking: “I’m killing carrot babies that will be future carrot adults!” You’re not alone with these thoughts. I constantly personify vegetables in my garden, they speak to me (that’s a whole other story) but it has to be done. Overcrowding doesn’t give them enough room to fully mature and grow into those full sized, straight, delicious and picturesque carrots that you so desire. How do I know you desire these carrots? Well… you’re still reading this lengthy article. If the fronds are starting to look bushy and tall, pull a carrot or two out to check their progress. You can tell a lot from testing a few carrots. If they are covered in what looks like a lot of hair, water them more. Those hairs mean they’re searching for water. Unless you’re planning to bake a carrot cake, my advice is to spread out the harvest. When I mix several varieties into one container, I usually pull one whole row and variety out at a time. Or mix it up! The harvest window for carrots is long, they’re not going to “go bad” while waiting to be pulled (that said, don’t leave them in the ground for months after they’re mature and ready). 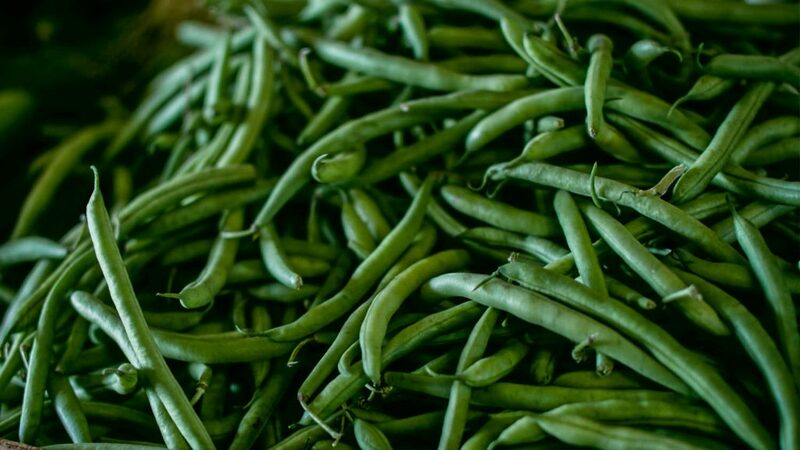 Harvest them as you need them and minimize the chance of them going bad in your fridge. Did know you can eat the fronds too? They make a wonderful pesto. The entire carrot is edible. Just another reason to grow this rewarding crop.